KUWAIT: Zain LOYAC Thailand Program participants with Zain and LOYAC teams at ZINC. KUWAIT: Zain, the leading digital service provider in Kuwait, hosted the orientation session for the participants of LOYAC’s Thailand Program at the Zain Innovation Center (ZINC) in the company’s main headquarters in Shuwaikh. The program is organized by LOYAC, a non-profit organization that aims at developing the youth’s talents and skills, and comes in exclusive sponsorship by Zain. Zain’s exclusive sponsorship to this cultural program comes as part of the company’s Strategic Partnership with LOYAC, which continues this year for over 15 consecutive years. The partnership comes in line with the company’s Corporate Sustainability Strategy, which closely focuses on enriching innovation and creativity within Kuwait’s youth, especially in regards to developing and nurturing the skills of young girls, expanding their cultural senses, and empowering them within the community. 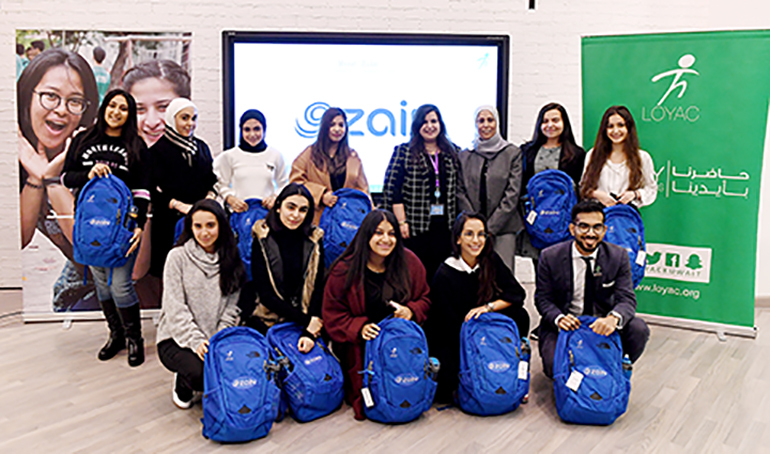 Zain hosted the orientation session for LOYAC’s Thailand Program at the Zain Innovation Center (ZINC) in the company’s main headquarters in Shuwaikh with the attendance of the participating girls, their parents, as well as Zain and LOYAC’s teams. During the session, the girls and their parents were briefed about the trip’s full program, its activities, and the destinations that will be visited. Zain’s exclusive sponsorship to this cultural program comes in line with its commitment to support any entity that offers the proper educational environment for the next generation as per the highest international standards. The company will spare no efforts in offering its support to such initiatives and programs that serve the community and contribute to the further progress of the country. The Thailand Program, organized by LOYAC, aims at offering girls aged 14 – 18 with an opportunity to take part in an educational and cultural trip to the Kingdom of Thailand. The trip’s program was designed to offer participants a chance to learn about Thai culture, explore Bangkok and its markets, as well as explore distant Thai villages through volunteering. The program aims to enrich the girls’ skills, develop their personalities, as well as offer them the chance to be confident in themselves and work as one team. The trip features many activities, including bamboo utensils and pot making, Thai cuisine cooking lesson, community service to renew and build homes of elderly and underprivileged families, and more. The Zain Innovation Center (ZINC) is a hub for entrepreneurs and digital investments launched as a platform for the innovations of students, youth, and entrepreneurs. ZINC encourages young minds to think and act creatively outside of the norm in an open, supportive environment for entrepreneurs to generate new ideas and develop them into viable opportunities. Last year, Zain’s support to LOYAC extended to a great number of educational initiatives and programs that catered to developing the youth’s skills and talents, including the KON Social Entrepreneurship Program brought to Kuwait in collaboration with Babson College in Boston, considered the most prestigious entrepreneurship college in the United States and the number one institution in the world for entrepreneurship education. The company also offered its exclusive support to LOYAC’s Internship Program at the United Nation’s International Fund for Agricultural Development (IFAD), as well as the LOYAC AC Milan Soccer School, and more. During October – December 2018, Zain hosted students of the LOYAC part-time training program who worked at the company’s various divisions, giving them an opportunity to gain experience in the private sector work environment. Zain also offered the students financial rewards in recognition of their efforts and as an encouragement to their dedication. Zain is proud to be one of the Strategic Partners of LOYAC since its inception, especially that it is considered one of the most prominent national programs that cater to the youth and offers them a healthy and empowering environment to develop their skills and talents in an educational, fun, and social atmosphere. Since its inception in 2002, LOYAC has grown to be the first choice of the youth in Kuwait when it comes to innovative and high quality educational programs. LOYAC runs several programs for the youth to develop their professional skills, enhance their personal growth and to help them find their sense of purpose by extending themselves to others.